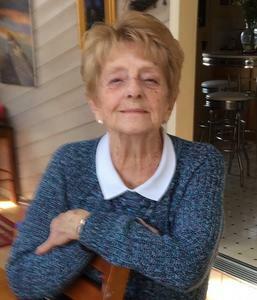 Dorothy A. McIntyre, born August 6, 1930, passed away March 18, 2019 at the age of 88. Her sunny outlook and courageous optimism brought a smile to everyone who knew her. She loved sharing coffee and conversation, the beach, her family and countless friends. Her inspiring and youthful spirit will live on in the happy faces of daisies, the magical flight of hummingbirds, the soft call of seagulls playing in the surf, and the comforting promise of sunrise and sunset every day. Dorothy and her zest for life will be greatly missed by all. She was preceded in death by her parents, Chester and Mabel Corey, a brother Chester, and son-in-law Wally Modrak. Dorothy is survived by her six children, Roseanna Rusch (Rob); Sue Modrak; Lynn Wright (Terry); William McIntyre (Lyn); Rita Berlin (John); Valarie Sherriff (Joel), nine grandchildren and fifteen great grandchildren. A memorial visitation will be 1-2:30 pm Saturday (April 13) with a time of sharing at 2:30 pm at the Dykstra Funeral Home-Saugatuck Chapel, 520 Lake Street, Saugatuck, MI.